A fragmented, lyrical novel in which a couple mourns the sudden and tragic loss of their children in unusual ways. Nao does little to push a cohesive narrative or propel her characters forward with plot structure, and the book is better for it. Instead, Ethos and Catholic feel their way along the darkened walls as their life, without consent, continues onward ... The absurdity of the way that grief pushes the couple to their emotional and psychological limits isn’t just devastating, it’s often very funny ... 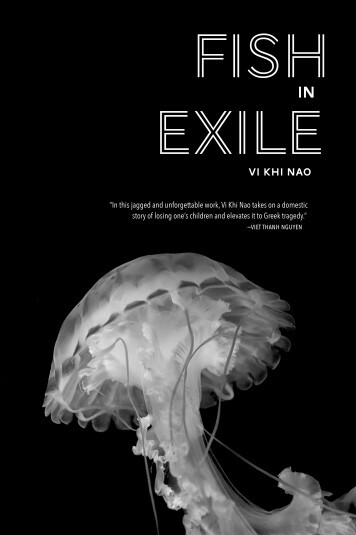 Fish In Exile is a book that never once attempts to explain itself, that immerses the reader in an aquatic underworld of pain and loss. Vi Khi Nao has created a meditation that splits open the numbing and disorienting problems of loss and mourning with language that breathes new life into an old suffering. This in turn brings about the kind of bewilderment one faces when the deeply familiar is made uncanny. In that, there is a kind of solace. That Nao is a poet is on full display — the prose here is expressive, muscular, and strange; almost exasperatingly precise ... This journey across the boundaries of form and genre, to write about what is un-write-aboutable, is a smart maneuver — it permits the reader to experience what has been written about over and over in a way that is fresh and absorbing in its difference ... As with so many of my favorite novels, Fish in Exile is less about plot (though there is one, loosely speaking) and more about its immersive experience. It asks a lot from the reader, but rightfully so. Yes, you must pursue meaning through chaos, wring beauty from brutality, grasp for solace among the slow-motion turmoil, but then again, isn't that also how you survive grief? As in Lauren Groff’s Fates and Furies, this structure allows for different views on the same events, but Nao’s book feels more organic and textured, less convenient and, like grief itself, vulnerable to downshifts and undercurrents ... Vi Khi Nao seems the elusive love child of Anne Carson and Samuel Beckett, a preposterous connection that, somehow, in the end, makes a lot of sense. What did you think of Fish in Exile?